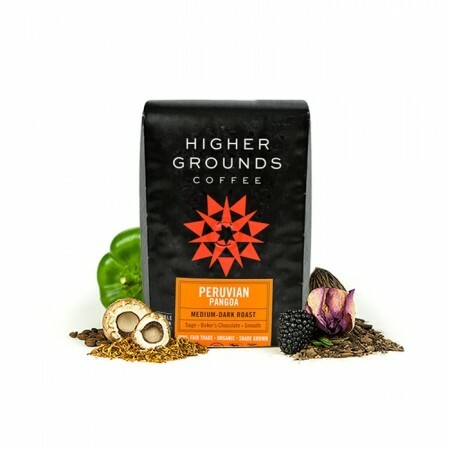 The Peru Pangoa was carefully roasted for you by Higher Grounds Coffee. This Fair Trade and Organic certified coffee was sourced from the growing region of Satipo in Peru and was produced by the Pangoa, Sol y Cafe, and Norandino Cooperatives between 1,100 - 2,000 meters. A true medium roast, this coffee has a smooth velvety note of baker's chocolate that dominates, while a subtle herbal note of sage can be found lingering in the background. Too darkly roasted for my tastes, although a nice full, rich flavor profile. It was a little harsh to me–a bit over-roasted for my preference. I feel like a loser because I can't taste sage, but this is divine. Send more again soon. Very good coffee. Full flavor. I definitely like Peruvian coffee.